Water, unlike most other natural resources, does not respect political boundaries. The natural flow of water, both on the Earth's surface and underground, routinely crosses these boundaries. When two or more sovereign countries share a watercourse, which could be a river basin , lake, or aquifer , it is considered to be an international watercourse. Most discussion about international watercourses, however, refers to river basins. 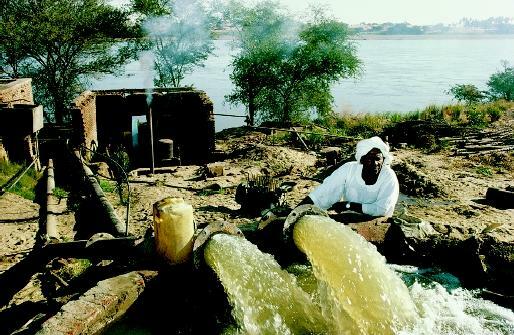 The Nile River is essentially the sole source of water supply for Egyptian irrigation, as represented by this farmer and his pump. In this arid region, the cooperation of Sudan (the upstream nation) is needed to ensure sufficient and usable river water reaches Egypt (the downstream nation). Although water is essential for all life and economic development, it is rarely distributed and shared equally by countries with international water-courses. As is demonstrated by the periodic occurrence of floods and droughts, a great annual and seasonal variation also can exist from basin to basin, and even within one basin. More than 260 river basins in the world are international in scope. * They represent nearly half the world's total land surface and a significant share of the world's available supply of fresh water. They include many of world's largest and most important rivers, such as the Amazon, Congo, Danube, Ganges, Mekong, Nile, Rhine, and Tigris–Euphrates. With growing populations, increasing pollution , and declining groundwater availability, many countries are becoming more dependent on international watercourses. In addition, they are particularly important in arid and semiarid regions, where they may be nearly the sole source of water. Managing water resources is a complicated process. Watercourses typically meet a variety of economic as well as ecosystem needs, although in many cases, not enough water is available to meet all of the identified needs. International cooperation is required to ensure that the mutual benefits of a shared watercourse are maximized. When a country's water needs are not being met in an international watercourse, the absence of cooperation is likely to result in tension. Some experts have predicted that conflicts over water might be inevitable as water scarcity increases. The potential for conflict appears to be highest in the developing world, where much of the land is either semiarid or arid, and most of the unexploited water resources are in international watercourses. The term "hydropolitics" refers to the relationship between countries or states with regard to shared water resources, ranging from cooperation to conflict, as well as their potential. Hydropolitics reflects the mingling of hydrologic and political processes, and in some international watercourses, it is a topic of great interest and concern. For example, in the Jordan, Nile, and Tigris–Euphrates river basins, hydropolitical issues are troublesome and play a high-profile role in the inter-country relationships. * The construction of a dam in an upstream country is especially contentious. In the absence of cooperation, downstream countries typically are concerned about the impact of a dam on both the quantity and quality of the water they receive. Droughts and floods also can routinely create additional tension when countries do not have agreed-on procedures for equitably addressing them in the context of shared watercourses. Although it has become widely accepted that cooperation among countries sharing a watercourse should lead to greater equity and more regional stability, effective international cooperation has been extremely difficult to achieve and maintain. Some countries have used their relative advantage to obtain a greater share of the water from an international watercourse. This advantage could be linked to one country having a preferred upstream position, superior military strength, or greater economic strength that has permitted it to develop the physical infrastructure, such as dams and canals, to divert and more effectively utilize shared waters. Usually, a transboundary water treaty is at the heart of effective long-term cooperation in an international watercourse. A treaty or similar legal document, signed by all countries, should establish clear guidelines for cooperation and sharing the water as well as measures to deal with conflict. Many transboundary water treaties have been implemented, but most are related to the navigational use of shared rivers. Yet navigation is rarely a source of tension because it is a nonconsumptive use of water and does not change the quantity and quality of water (except for possible pollution) available to other users. Regardless, few international transboundary water treaties provide the means to address fully the quantity and quality issues of shared waters as well as mechanisms to address conflict. The United States possesses effective transboundary water treaties with both Canada and Mexico. These treaties address both water quantity and water quality issues and have led to the establishment of binational commissions to oversee the management of shared waters. Despite the friendly relations that exist between the United States and its neighbors, tensions related to shared watercourses periodically surface. Agreed-on means exist to address conflict when it arises. In addition to the general absence of effective transboundary water treaties, the development of comprehensive and well-accepted international water laws, broadly covering international watercourses, has also proven to be elusive. The recent implementation of a number of treaties, protocols, and conventions on international watercourses indicates that the international community strongly supports arrangements to enhance cooperation. Some of these recent agreements call for cooperation on specific river basins, whereas others address broader regions involving multiple river basins. The most notable development was the adoption in May 1997 of a United Nations (UN) Convention on the Non-Navigational Uses of International Watercourses. This Convention, which involved nearly 30 years of work by the UN International Law Commission, is important because it attempts to establish a broad, reasonable framework to address the shared use of international watercourses. Establishes that the linkages between surface water and groundwater need to be considered. Yet concerns exist about the effectiveness of the Convention, because many of its requirements are vague and possibly in conflict with one another. In addition, the absence of a strong international authority with regard to international water law makes dubious the enforceability of the Convention. The United Nations and the World Bank have emerged in recent years as the principal proponents of international cooperation with regard to shared watercourses. The World Bank has actively brokered water-related cooperation in a number of countries. Cooperation has been a requirement of the World Bank for assisting countries in the management of international watercourses by providing them with needed technical and financial support. Other organizations that promote international cooperation include the World Water Council, the Global Water Partnership, and numerous water-related professional associations. A great need exists for countries to cooperate in international watercourses, many of which are experiencing ever-increasing water stress. The 1997 UN Convention clearly demonstrates that most countries agree that international cooperation is needed, although the actual levels of cooperation have fallen well short of expectations. If effective cooperation does not materialize, little doubt exists that tensions over water in many international watercourses may increase, resulting in uncertain outcomes. SEE ALSO Conflict and Water ; Hydropolitics ; Hydrosolidarity ; Law, International Water ; Rivers, Major World ; Transboundary Water Treaties . 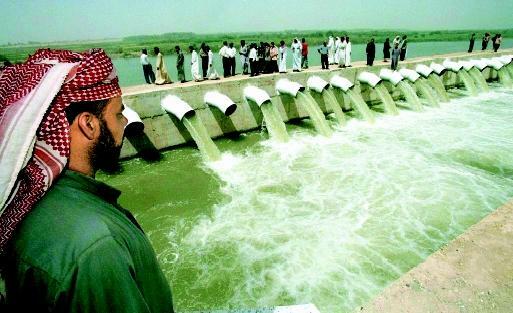 A 16-kilometer-long (10 miles) irrigation canal on the Tigris River began operation in 2000 to provide water for drought-stricken agricultural lands in the northern Iraq province of Diala. The Tigris, one of Iraq's two major sources of water, is part of the Tigris–Euphrates watershed, an international basin. Elhance, Arun P. Hydropolitics in the Third World: Conflict and Cooperation in International River Basins. Washington, D.C.: U.S. Institute for Peace, 1999. Gleick, Peter H. The World's Water: 2000–2001. Washington, D.C.: Island Press, 2000. Salman, Salman M. A., and Laurence Boisson de Charzoures, eds. International Watercourses: Enhancing Cooperation and Managing Conflict. Washington, D.C.: World Bank, 1998. Wolf, Aaron T. "Conflict and Cooperation Along Criteria International Waterways." Water Policy 1 (1998):251–265. ——. "Criteria for Equitable Allocations: The Heart of International Water Conflict." Natural Resources Forum 23 (1999):3–30. World Bank. Water Resources Management: A World Bank Policy Paper. Washington, D.C.: World Bank, 1993. Wolf, Aaron T. et al. International River Basins of the World. Oregon State University. <http://www.transboundarywaters.orst.edu/publications/register/> . WHAT IS THE DUBLIN STATEMENT? The effective management of water resources demands a holistic approach linking social and economic development with protection of natural ecosystems. Water development and management should be based on a participatory approach at all levels. Women play a central role in managing and protecting water. Water has an economic value in all its competing uses and should be recognized as an economic good. The Dublin Statement, as it has become commonly known, has gained wide acceptance within the international water community. * See "Hydropolitics" for a map showing the world's international river basins. * See "Law, International Water" for a case study (sidebar) on the Nile River.